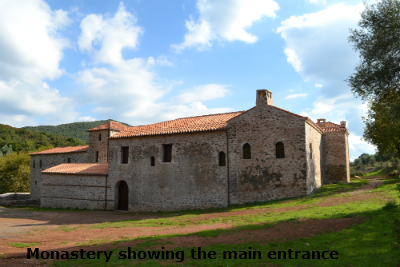 The photograph above is of the Andromonastiro Monastery near Petralona, Messinia since it has been renovated. The Monastery of the Transfiguration, also known as Andromonastiro, is located southeast of the village of Petralona, near ancient Messene, in a lush ravine of great natural beauty. 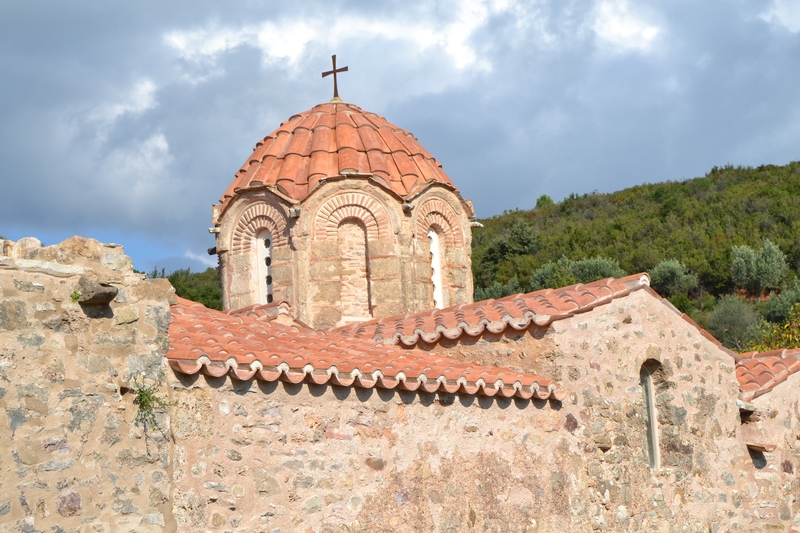 The monastery was built in the 13th century by the Byzantine Emperor Andronicus II Paleologos in order to commemorate the Patriarch of Constantinople Athanasios I who came from Androussa. Abandoned for many years, the complex was spared random modern alterations and thus retained many of its original features, which are valuable for the study of the development of monastic architecture. 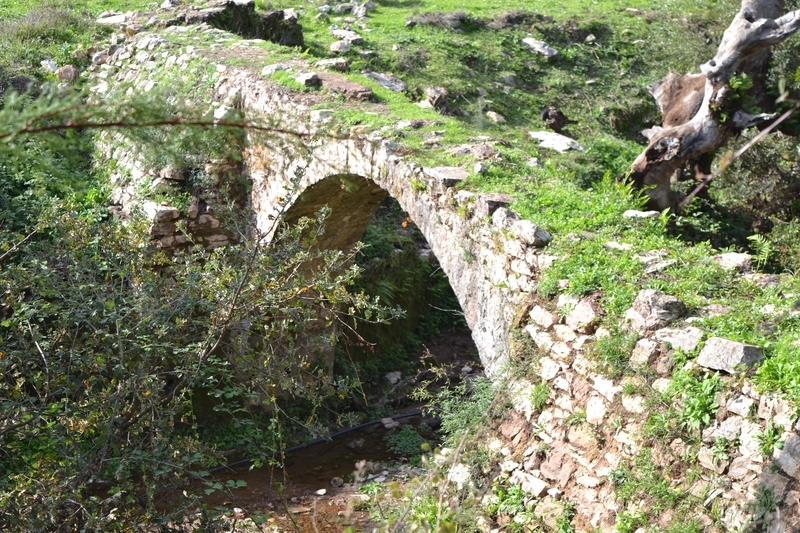 The monastery was left to decay during the last four decades which badly affected its state of preservation. The refectory and adjacent tower presented severe problems and were about to collapse. Built on a partially artificial west to east sloping terrace, the fortress-like complex comprises buildings of various periods and functions with an irregular ground plan. Andromonastiro is characterized by highly fortified elements and consists of the catholic monastery, a three-story tower, a two-storey wing and a two-storey building, where can be seen the passageway at the main entrance to the monastery, an underground tank and other secondary buildings. 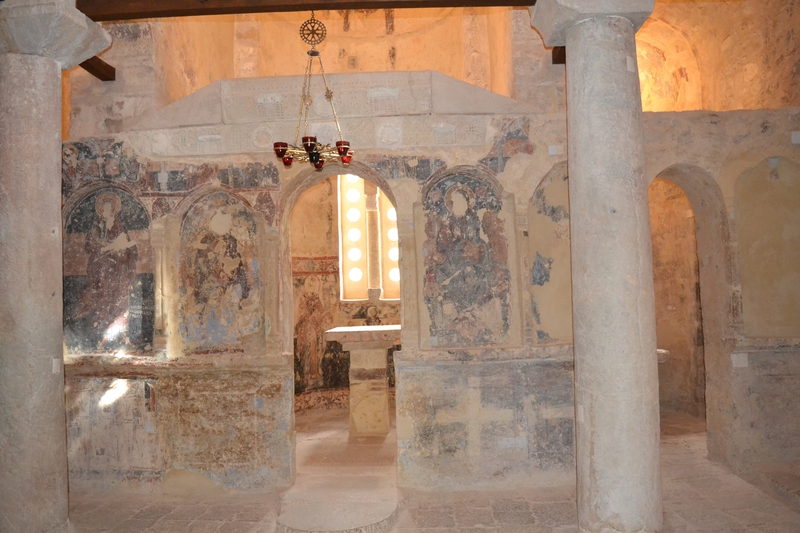 Implemented by the Ephorate of Antiquities of Messenia, the monastery's restoration programme included two projects. 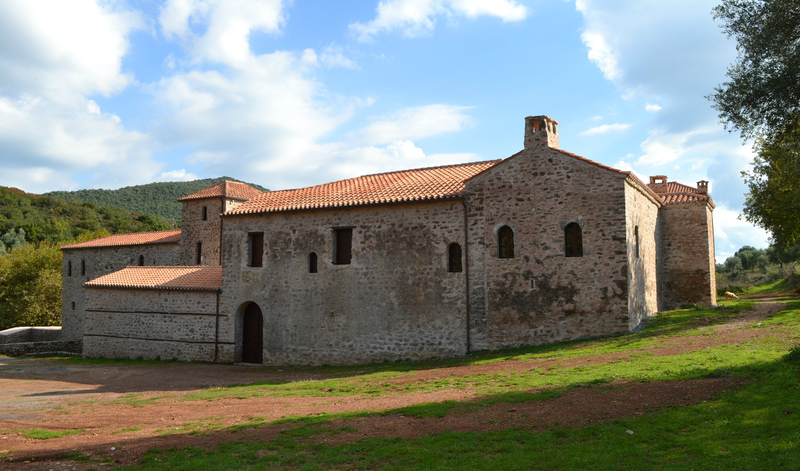 The first one entitled "Restoration of the building complex of the Transfiguration Monastery (Andromonastiro) with an 800,000 euro budget started in May 2011. The second project entitled "Restoration of the west wing and covered passage building of Transfiguration Monastery (Andromonastiro)", with a 1,150,000 euro budget started in August 2013. 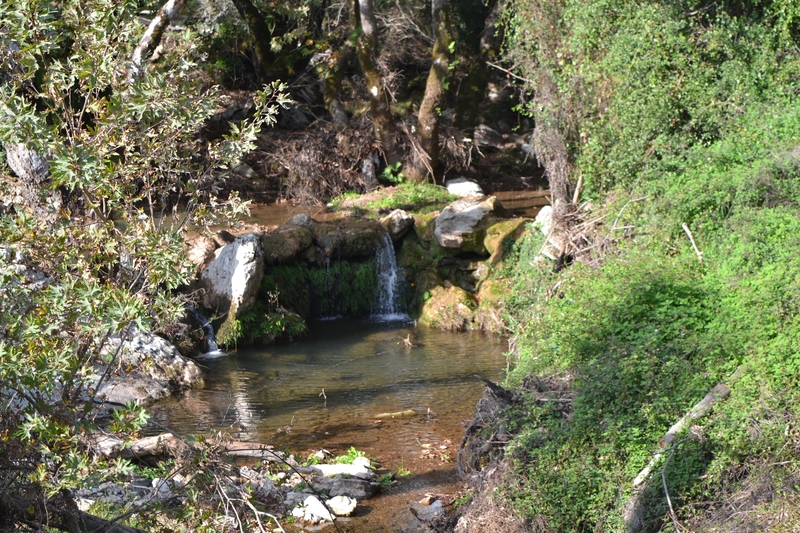 The projects were part of the Sustainable Development and Quality of Life in the Peloponnese of the Operational Program Western Greece - Peloponnese - Ionian Islands 2007-2013. Restoration works were almost complete in November 2016. 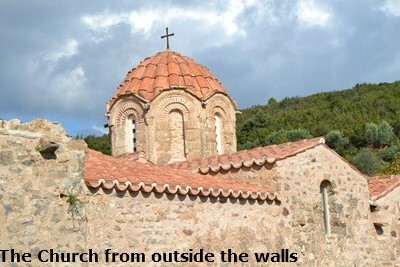 The Katholikon (main church) of the monastery is a relatively large cross-in-square building with a narthex at the west side vastly rebuilt during the Post-Byzantine period. In its initial form it was flanked by open porticos at the north, west and south sides, reminiscent of the nearby church of Zoodochos Pigi (Samarina). The Catholic Church in Andromonastiro is dedicated to the Transfiguration of the Savior, while there are two chapels, right and left, dedicated to Saint Georgios and Saint Catherine. 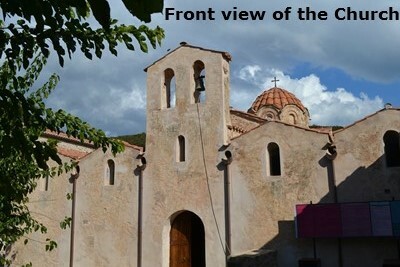 The main church stands on a complex of vaulted structures that cover the most important water source of the area,which still supplies nearby Androusa, while a well-organized pipe system served for the water management. During the course of the renovations a glass floor has been placed over the water source inside the church. 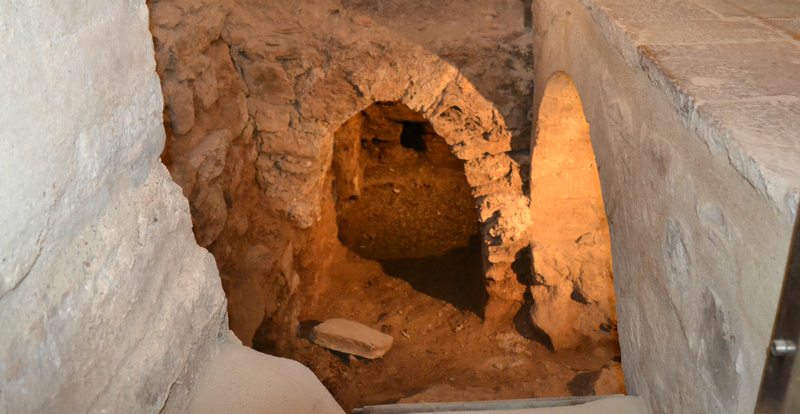 After the original building of the Church a small vaulted room, probably a chapel dedicated to Prophet Elias, was added to the south of the relevant cross-arm. 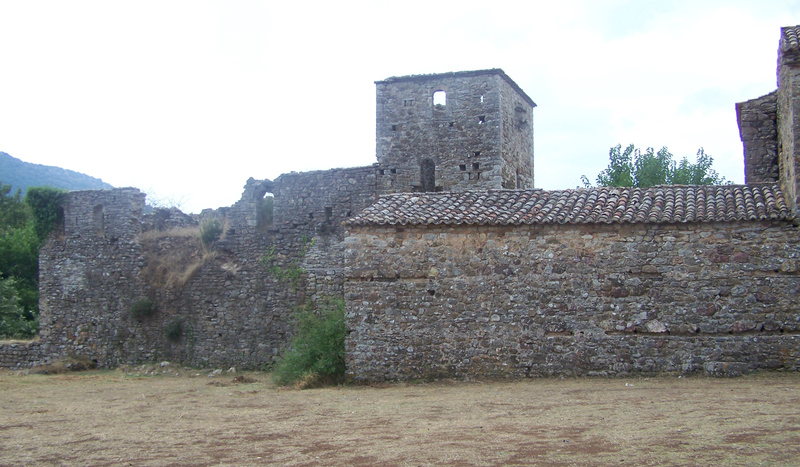 Possibly by the early 17th century, the main church was surrounded by an exonarthex and the existing side aisles. In the same period, the east side of the north aisle was transformed into a chapel. Its current dedication to Saint Catherine probably dates to the late eighteenth century, when Andromonastiro was annexed by the famous Monastery of Saint Catherine in Mount Sinai. 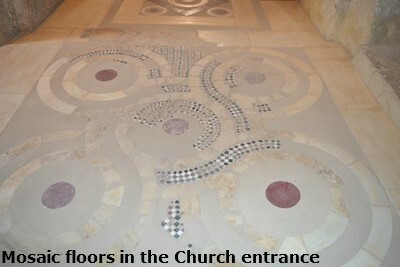 The Church was originally paved with an elaborate opus sectile mosaic, part of which was revealed and conserved in the narthex. 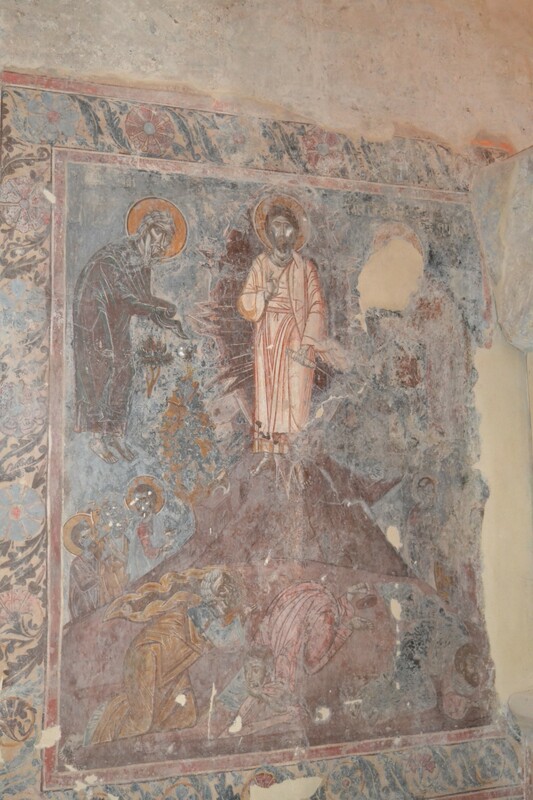 New elements revealed during the restoration of the main church confirm a date for its first structural phase to the first decades of the 13th century. 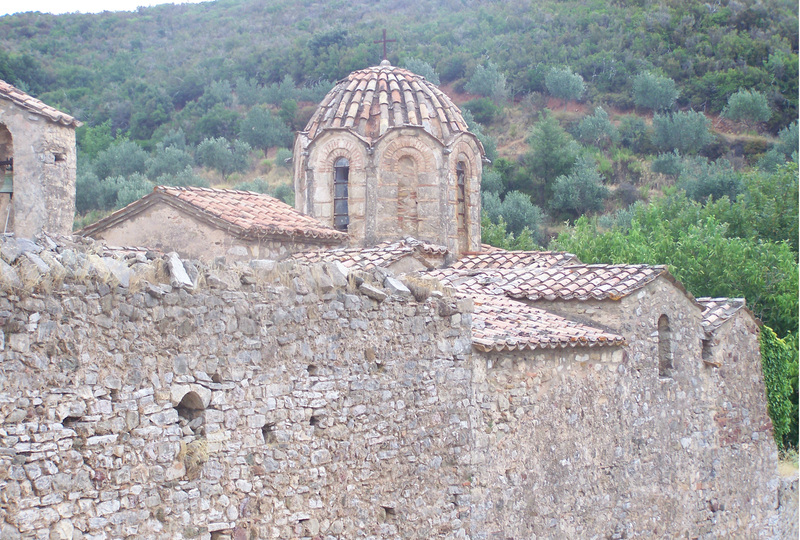 Hence, the katholikon of Andromonastiro represents one of the most significant monuments built in the Peloponnese, right after the installation of the Franks in the region and the foundation of the Principality of Achaea. 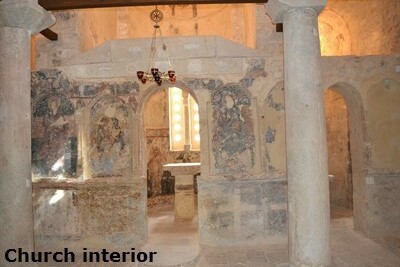 The nave is decorated with wall paintings, now partially preserved, which had been covered almost entirely with several coats of lime. Three main painted layers, dating to the thirteenth, seventeenth, and eighteenth centuries, were uncovered during conservation. The original marble templon is considered to be a creation of the famous masons' workshop that created the templon of the church of Zoodochos Pigi (Samarina). The carefully carved architrave of the original templon nowadays tops the katholikon's later built altar screen; this should be dated to the 18th century, according to the style of the wall-paintings that decorates its frontal side representing the Christ, Virgin Mary and Saint John the Theologian. 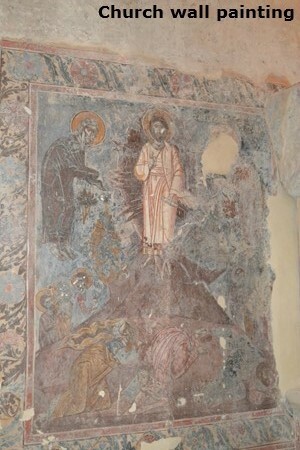 The new elements revealed during the restoration of the main church confirm a date for its first structural phase to the first decades of the 13th century. 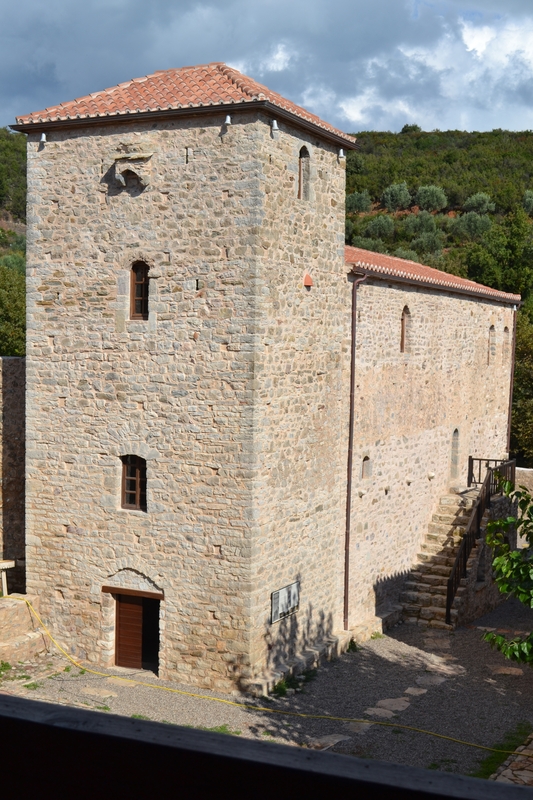 Therefore the Church of Andromonastiro represents one of the most significant monuments built in the Peloponnese, right after the installation of the Franks in the region and the foundation of the Principality of Achaea. The restoration of the Church included: the reparation of the roofs, the consolidation and filling of the joints and the restoration of the decorative brickwork. 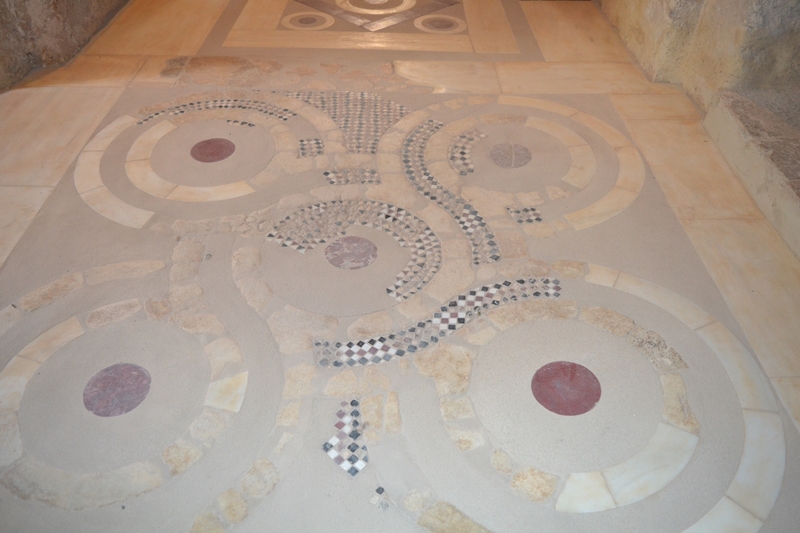 The wall-paintings, the relief decoration and the opus sectile pavement of the narthex have undergone careful conservation, while the rest of the floors were repaired. New doors were installed at the two outer gates of the exonarthex and the wooden door of its main entrance was restored. 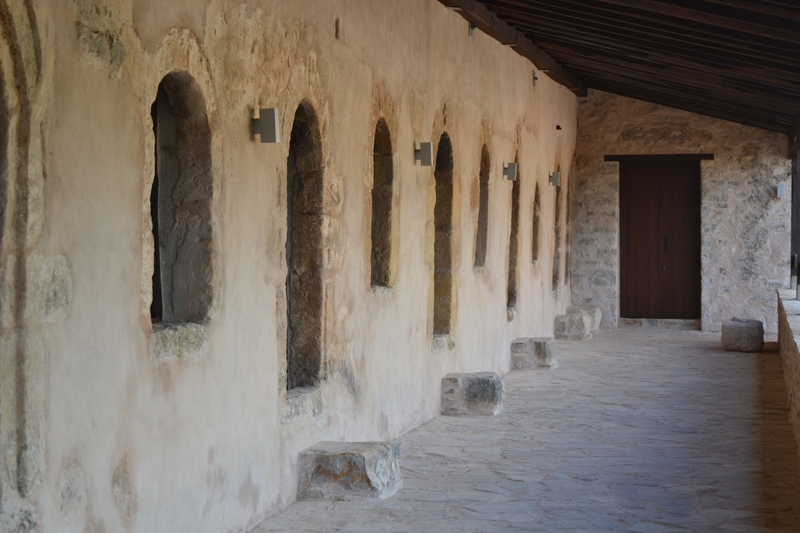 In the original windows of the nave and the chapel of Prophet Elias, window barriers were placed, while, in those of the Post-Byzantine additions, metal frames with glass panes were used. North of the katholikon rises the monastery's original refectory, an elongated structure (14.30 x 5.30 m.) with a complex architectural history on the west side of which a tower was added in a later period. During its first construction phase, it had the shape of a two storey vaulted building, which may be dated to the 13th-14th century, according to its morphological and structural elements. 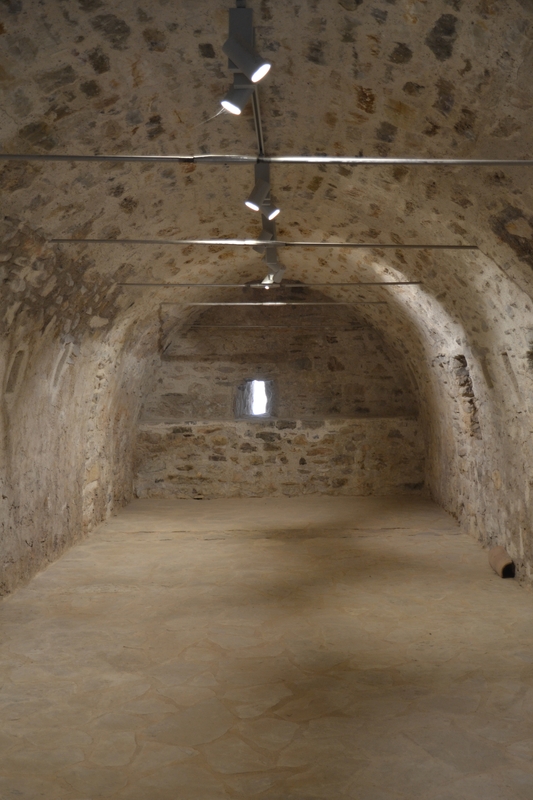 Its pointed barrel vault was covered by a two-pitched roof with large ceramic roof-tiles, the imprints of which were discovered during the building's recent excavation. The last major alteration of the refectory took place after the construction of the impressive four-storeyed tower against the building's west side. This required the reconfiguration of the building's entry and is probably to be associated with the construction of the monumental southern external staircase, which did away with the south facade's timber-roofed awning, and the opening of the door in the second floor's south wall. Writing on this door's left doorjamb mentions the date of the refurbishment as July 1726. An awning lined the south facade, as indicated by the preserved corbels for the timber roof, which consisted of reused Early and Middle Byzantine stone elements. The ground floor had no windows and probably served as a storeroom. Small single windows dimly lit the single room on the upper floor, which probably housed a wooden table for monastic meals. 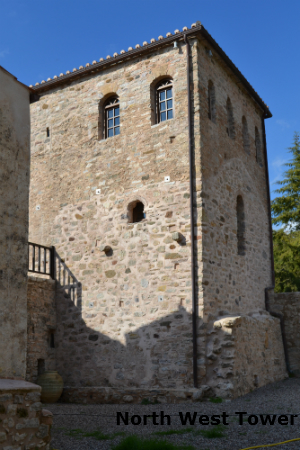 Sometime later, the space over the two-pitched roof was leveled and converted into a terrace with crenellated parapet. Traces of the crenellations are still visible on the south and east sides. Gutters in various locations ensured the drainage of rainwater. The terrace was accessed by an internal stone staircase, which was built into the thickness of the wall and ended in gable-shaped top. Designed to fortify the building, this alteration is to be linked to the insecurity caused by the repeated Turkish invasions of the mid-fifteenth century. At a later date, probably in the early seventeenth century, a third floor was added by raising the terrace's parapet, adding a four-pitched timber roof, and converting the crenellations into windows. A floor of stone plaques covered the previous phase's terrace. 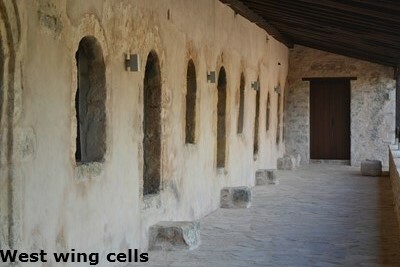 The west wing comprises the two-storied building of the stables and first-floor cells. Two elongated, vaulted stables occupy most of the west wing's ground floor. Between them lies the monastery's wine press, with a small cistern for wine must in the east. 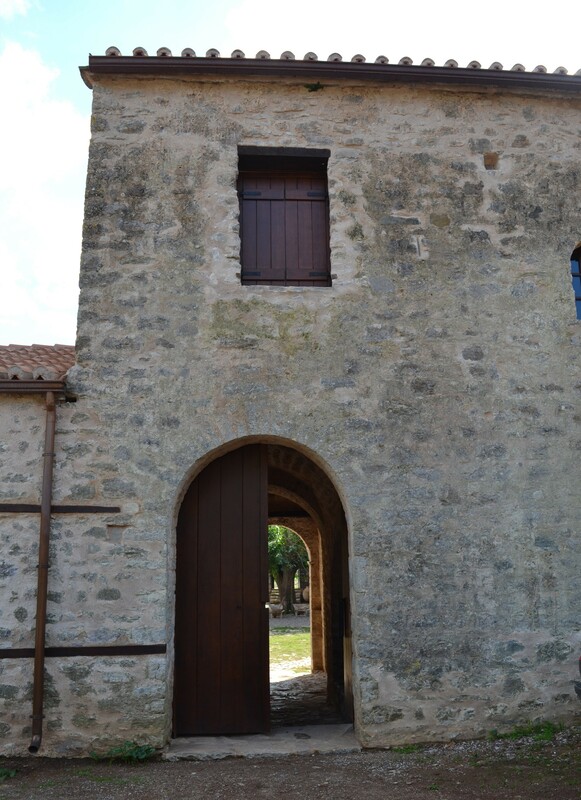 Access to the wine press was from the west, through an arched door, which opened to the monastery's exterior. The six small, vaulted rooms to the east of the stables, which probably date to the seventeenth century, were incorporated into this new wing during the extensive refurbishment of 1753. 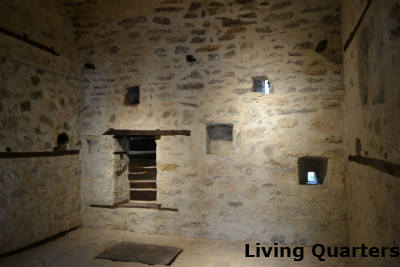 All of the cells - except the second from the north - have a fireplace on the west side, cupboards, and a small arched niche for an icon in the east wall. 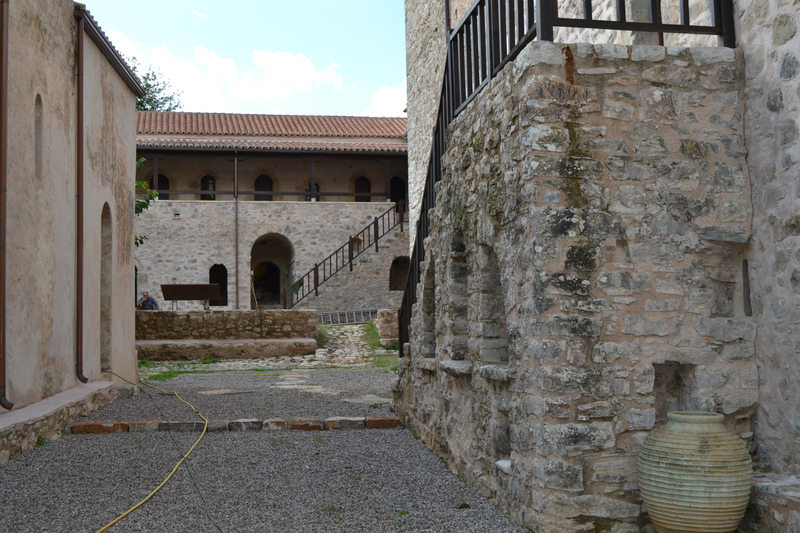 The first floor's northwest corner occupies the synodikon a reception apartment for the heads of the monastery and the official guests. It consists of a large, vaulted room with fireplace and a small toilet to the west. The west wing's first floor is accessed from the courtyard by a stone staircase. This floor features six small cells, each with an arched doorway and a large window opening to the hayat. The northwest wing includes the bakery with two built-in ovens and a labyrinthine two-storied structure, with many rooms and a complex building history. A covered passageway in this wing's ground floor serves as the monastery's main entrance. The construction of the northwest wing can be dated on the basis of morphological and structural characteristics to the seventeenth century and should probably be associated with the monastery's extensive refurbishment by the monk Anthimos of the old Voulkano Monastery before 1612. Extensive renovations and additions were carried out aimed at improving the monks' living conditions during the monastery's long history. Two timbered roof spaces were built consecutively on the northwest wing's south side in the eighteenth and nineteenth centuries. The east one was two-storeyed from the start. In the late nineteenth - early twentieth century, a second floor was added over the smaller timber-roofed space, and the northwest wing acquired its present form. Many of the northwest wing's original arched openings were significantly altered during this period. 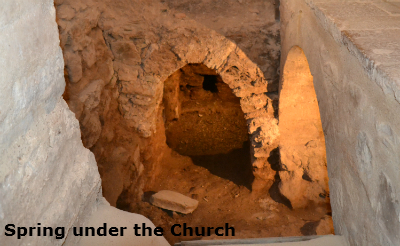 Some were converted into rectangular openings, others were walled in, and several simple rectangular doors and windows without frames were opened. 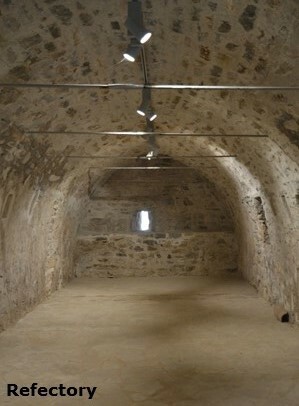 The interior walls of the first floor were plastered, and a wooden floor was laid over the original stone floor in the large vaulted room of the first floor. Renovations have included: reconstruction of the masonry by rebuilding the destroyed parts of the walls; excavation and removal of the soil from all of the refectory's storeys; rebuilding of the vault in the refectory's ground floor and stabilization of the other parts of the vaulting; joint-filling and grouting; injection of natural hydraulic lime in walls; restoration of the floors, the staircases and the cornices made by slabs; electrical installation; reconstruction of the roofs and installation of waterspouts and, finally, of new chestnut door and window frames. 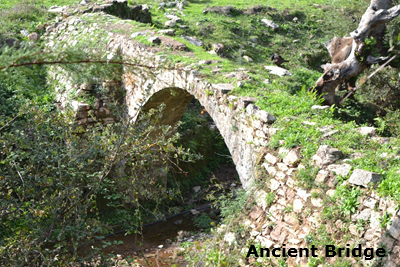 There is a very old bridge near the monastery which spans the water course that is fed by the spring that runs underneath the church. In Andromonastiro there is also the church of Saint Lazarus which is the cemetery church of the convent, 100 meters away from the complex. 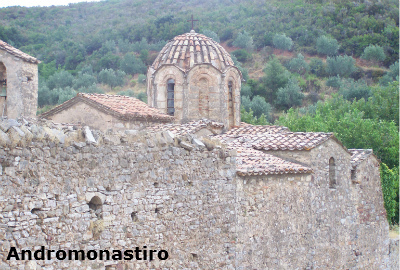 Since 1962 Andromonastiro has been dependent on the monastery of Voulkano and has not had any monks. Every year on August 6th when the Transfiguration is celebrated, hundreds of worshipers gather in Andromonastiro. I understand that the monastery is open to the public on most mornings. The day I visited there were still workmen on the site but I was shown round by a very knowledgeable gentleman who was etremely helpful.